Dollar General Weekly Ad Springfield MO offers Household products including 3M Scotch-Brite Scrub Dots Heavy Duty or Non-Scratch 2-4 pk. Clorox Concentrated Bleach 64 oz. Crayola® Classic Markers 10 ct. or Sharpie Markers 2-3 ct. DG home Super Eraser 4 pk. or Soft Scrub 24 oz. or 4-in-1 Toilet Care., DG home Bath Tissue Soft 12 Reg. rolls or Ultra Soft or Strong 9 Reg. rolls. Fabuloso Multi-Purpose Cleaners 128 oz. or DG™ home Disinfectant Wipes. See Home Essentials like 18 Gallon Tote, Angel Soft Bath Tissue 9 Mega rolls. Ajax or Palmolive® Dish Liquid 52 oz. Charmin Bath Tissue Ultra Strong or Ultra Soft 8 Mega rolls. Scrubbing Bubbles Bathroom Trigger 32 oz. or Drop-Ins 3 ct. Sparkle Paper Towels 6 Big rolls. Suavitel Liquid Fabric Softener 34 load/50 oz. 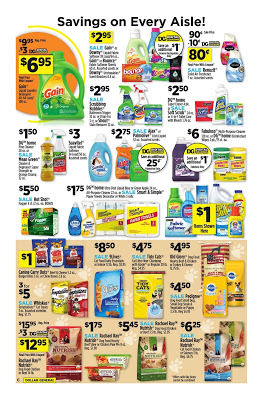 Here are Dollar General weekly ad circular! 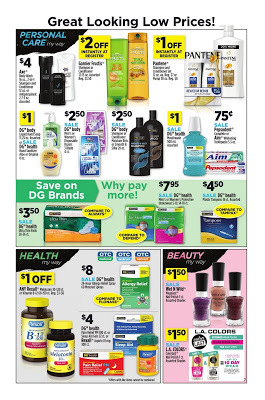 Health & Beauty is available at Dollar General for more saving this week! Axe Body Wash 16 oz., 2-in-1 Shampoo and Conditioner 12 oz. or Antiperspirant 2.7-3 oz. Ivory bar soap 3 ct. or 10 ct. Garnier fructis shampoo or conditioner 12-13 oz. L.A. COLORS Colorlast Nail Polish 1 ct. Pantene Shampoo and Conditioner Set 12 oz. ea. or pump 30 oz. Pepsodent Complete or Aim Whitening Toothpaste 5.5 oz. DG Body Liquid Hand Soap 11.25 oz. or DG Health Hand Sanitizer Aloe or Original 8 oz. Fritos 9.25-9.75 oz. or Cheetos 8-9 oz. V8 Splash 64 oz. or Smoothies 46 oz. Heinz Tomato Ketchup 38 oz. Rice Krispies Treats Mini 7.6 oz., Stauffer's Animal Crackers 20 ct.